Congressional papers and correspondence, including bills sponsored and cosponsored, speeches, appointment books, news releases, materials related to work on the Armed Services and Veterans Affairs Committees, photographs, and memorabilia. Finding aid in progress. Researchers should contact repository regarding access restrictions. Audiotape Reel: 1970, 10 commercials on 1 audiotape reel. 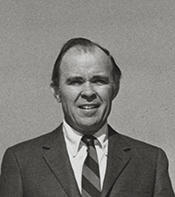 The commercials were used during Elwood Hilliss campaign for the 1970 U.S. congressional election in District 5 of Indiana, Republican Party.